The Dade Heritage Trust held their meeting last week where architect Richard Heisenbottle presented his plans for the Coconut Grove Playhouse. Mr. Heisenbottle's plans will please all historians, in that it does not call for a demolition of the current building. In fact, it makes the current structure into an elegant structure with retail on the first floor, facing Main Highway and Charles Avenue. Awnings give it an urban feel, the cool, beige color makes it look majestic. He is quite sure the grandeur can be returned to the playhouse without hurting the current structure. The seating capacity would be reduced to 700. Most of the interior would of course be redone including the stage area, but this is good in that it would allow larger productions and allow for larger sets. The basic plan calls for restoration and not demolition. Mr. Heisenbottle knows the history of the playhouse very well, he knows details and dates from all previous renovations and restorations. He's very interested in seeing that the right thing be done with the structure. Artist Lisa Remeny, longtime Grove resident, was present at the meeting. She told me, "Richard Heisenbottle has the best plan I heard yet for truly renovating and restoring the playhouse to its former glory. He actually has renovated many theaters including The Colony [in South Beach] and we all should get behind his plan." Depiction of interior of "new" playhouse. County Commissioner Xavier Suarez was instrumental in helping get this plan presented, he and his aide J.C. Garrido, have worked tirelessly on the project. They and Mr. Heisenbottle suggest that the Governor get involved, his support is needed so that the state can take action. Governor Rick Scott may be reached at 850-488-7146 and at rick.scott@eog.myflorida.com To contact Commissioner Suarez to see how you may help, and to thank him for his endless support, please call 305-375-5680 or email District7@miamidade.gov. Renderings provided by architect Richard Heisenbottle. 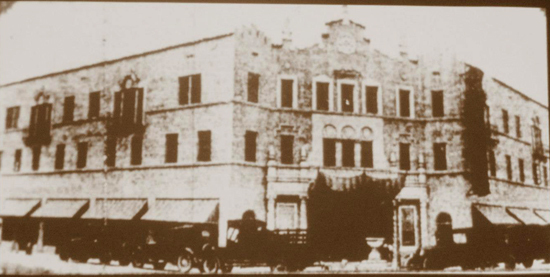 1926 Image of the Coconut Grove Playhouse. Wow! Good info. was discussing at dinner with my Cloisters neighbors last night. Any actual theater professionals involved in these plans? Because without consulting someone who works in the industry, the plans won't even be worth the paper they're printed on. That Proscenium looks awfully small. What kind of limited productions can be done with that small and low a stage area? Community plays and local music concerts and kids plays?